Awakening wounded in a darkened cell, their psychic abilities blocked, Aden and Zaira know they must escape. But when the lethal soldiers break free from their mysterious prison, they find themselves in a harsh, inhospitable landscape far from civilisation. Their only hope for survival is to make it to the hidden home of a predatory changeling pack that doesn't welcome outsiders. And they must survive. A shadowy enemy has put a target on the back of the Arrow squad, an enemy that cannot be permitted to succeed in its deadly campaign. Aden will cross any line to keep his people safe for this new future, where even an assassin might have hope of a life beyond blood and death and pain. Zaira has no such hope. She knows she's too damaged to return from the abyss. Her driving goal is to protect Aden, protect the only person who has ever come back for her no matter what. This time, even Aden's passionate determination may not be enough - because the emotionless chill of Silence existed for a reason. For the violent, and the insane, and the irreparably broken, like Zaira. 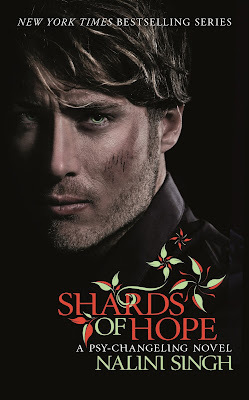 Shards of Hope is #14 in the Psy/Changeling series by Nalini Singh. It is my favourite paranormal series, and in fact were the first ever paranormal books that I read. This book is the story of two Arrows, Aden their leader and Zaira. They are opposites - at one end of the alphabet from the other! Their journey together has a history and as we witness their journey towards each other in the now, we are also given much of their background - especially Zaira. Silence has fallen and it is now that the Psy are feeling their way forward into a new way of living. Aden as their leader wants to make that a good experience for them all, he never wants to go back to the violent imposition of Silence, where no feeling was allowed and was brutally tortured out of them. Aden cares, it is said he was never fully Silent and now he makes an excellent leader, working closely with his Arrow commanders, giving each responsibility and trust. When he is thrust into a changeling group he watches and learns from the alpha and changelings in the pack. Alphas are caring and loving towards all in the pack but are also ready to set boundaries. It was wonderfully moving to see Aden put all that he was learning and intuiting into practice with the young Arrow children, and with the older ones who were at times at a loss - all at sea with Silence ripped away. Aden's parents have always seen him as weak, and still cannot understand how he can be a suitable leader for the Arrows. Only Walker, a teacher, has seen what he might be truly capable of. Surprises abound! Zaira as a child has experienced deep cruelty and there is a rage within her that she believes may see her doing something that will harm others. She was made to believe she was of no value, no one cared, no one loved her. Loneliness - deeply ingrained in her. Yet we learn that Aden was there for her when he could be. She is very fearful that with the discipline of Silence gone she will be unable to control that feeling of rage that eats at the very core of her. This is her challenge. I loved the surprising bonds Zaira formed with children, it was an indication of what was truly within her heart. However Zaira is an Arrow, she is hard, honed and a force to be reckoned with. Shards of Hope has an action filled, suspenseful and complex plot. Tense and tough. Nail biting times. Moments of deep tenderness and emotion. Moments of evil and chilling grooming. It was fantastic to meet up with characters from previous books as they all worked with each other to deal with the new threat emerging. Someone is out to destroy trust among the various groups in the world, and is especially targeting the Arrows. Nalini Singh's writing is well crafted perfection. Plot, characters, settings and intricate interactions all combine to give us, the reader, a riveting read. I especially loved her world view and the values that shine through in Shards of Hope. Good review! Was curious about this title but I see there are many many ones that came before it and I assume they have to be read in order. I'm so glad that you have a fave series to follow. It's such a good feeling to connect with fictional characters and care about them. I think any series to get the full joy you do need to read in order and this series lends itself to that. It could standalone, there is enough detail to help it, but personally I wouldn't recommend reading it by itself. Great review Kathryn. I'm glad you loved this. This must be a wonderful series - given this is #14. I don't think I have read more than three in a series. Designed by Parajunkee. Powered by Blogger.